· First Impressions are a new addition to Wine Mizer. They are short reviews based on an initial impression. No maps. No lengthy reviews. No technical specifications or information on how the grapes are vinified. I hope you find “First Impressions” interesting in their simplicity. A rainbow of wine: Red, White, Rose, and, and …… and ORANGE? Yes, orange! Quady Winery in Madera California makes “Essensia” from Orange Muscat grapes. 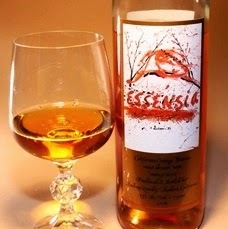 Quady makes only dessert wines and “Essencia” is certainly that. Wine Enthusiast recommends serving it with cheesecake. “Drink it with cheesecake and go to heaven” they said. Then they gave it 93 points. I agree: flavors of apricot, honey and golden raisin, but for me – a strong taste of orange. While it is definitely sweet, it’s not cloying and the wine finishes cleanly with an excellent balance of acid to fruit. This would be an excellent wine to include at holiday dinner gatherings. (And I will try it with cheese cake). 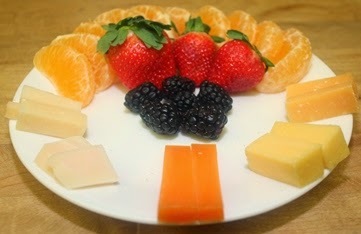 cheeses and Sumo Mandarin Orange segments. Quadry seems to be on to something with their decision to specialize in dessert wines because they have done it so well. While many “new world” dessert wines are syrupy and cloying and better served atop pancakes, Essensia is a sweet wine but with flavors well integrated. Grapes are obviously respected and allowed to announce their natural character without excess manipulation. In addition to Essensia, Quady offers “Elysium” from Black Muscat grapes and “Electra” from Orange Muscat. “Electra” is different from “Essensia” in that it is blended (25%) with Canelli and is made frizzante (a little “bubbly”) as a Moscato d’ Asti). The vintage I have is a 2010 and is drinkable through 2025 with proper storage. Average retail price is $26, at the winery $22. Like Wine Mizer on Face Book for mini-reviews, fun facts, recipes and more.